If you’re reading this post on your phone, make yourself comfortable. It might hurt. Text neck is the term for the modern spine ailment that everyone needs to know about. It’s the same “forward head posture” that afflicts computer operators and desk workers since humans moved from manual labour to sedentary jobs. Now young people are already showing signs of repetitive strain from overuse of mobile phoneswhich manifest as neck, jaw, and shoulder pain, headaches, and spinal changes. It doesn’t take long before the muscles of our neck shorten and overwork adapting to their new normal workload and position. The Cinderella Hypothesis is the theory that just like Cinderella some muscles fibres do all the work and are constantly used over time and generate trigger points and muscle pain. Our posture and the way we breathe can lead to these muscles doing the wrong job and being overworked just like Cinderella. Over time the joints and ligaments deteriorate to a point where the neck stays stuck in a forward head position. This gives us a hunched back and dowager’s hump posture. Thanks to our heavy heads, weighing on average 5kgs, (the size of a 2 month old child) being a few centimetres out of the optimal position (right above the spinal column) and at an angle of around 60 degrees when texting we also get pain in our lower backs, far from the location of the problem. Imagine walking around with a two month old baby hanging around your neck while you worked or texted. Does that sound comfortable? What are the effects of shallow breathing? Humans and animals take short shallow breaths when they’re nervous, threatened, afraid, or anxious. Shallow breathing is the opposite of belly breathing or abdominal breathing. When we breathe “shallow”, we recruit our back up breathing muscles of our neck and chest to inhale, we often over-inflate and stay hyperinflated in our ribcage. We can do this for short periods of time when stressed but we are not designed to be on alert all the time. When we take shallow breaths, we over-breathe oxygen and breathe out too much carbon dioxide stressing our body and telling our nervous system to stay on red alert. In contrast, breathing in a calm pattern that activates the rest digest and recovery part of our nervous system requires us to lengthen our exhale and slow down the number of breaths we take a minute. To prevent the negative long term effects of this “stress-like” state, we must try to prevent shallow breathing. But this is where posture can cause us further problems. People with poor posture (rounded shoulders, tight pectoral muscles, forward heads) tend to have trouble establishing a good breathing pattern. Diaphragmatic breathing is difficult for these people and even their shallow breaths are inefficient because of the restrictions around the chest. The implications are severe. To reset your posture you need to find ways to release these bad breathing muscles that get short and tight from overuse. You can check out our free 15 minute pilates video to give you exercises that can gentle release these muscles. Stress-related illnesses, sleep problems, respiratory problems, immune system weakening, and high blood pressure are all symptoms of long term shallow breathing. Posture affects our health and how well we perform in all areas of life. For example, people with rounded shoulders, hunched backs, and necks that force their gaze towards the floor, generally do less well at interviews, are perceived as less attractive, and have a gloomier outlook on life. Your phone is a big part of the problem. And let’s not forget about the time we spend at desks in school and work. Kids spend years hunched over books and computers at a desk. We’re only starting to understand the implications of the “always on” culture that the smartphone has introduced to society. Constantly being bombarded by messages and social media activates our stress response dumping cortisol and adrenaline in our blood, mobilising our body into action. No wonder it is hard to switch the brain off and sleep at the end of the day after being on social media or working at a computer. 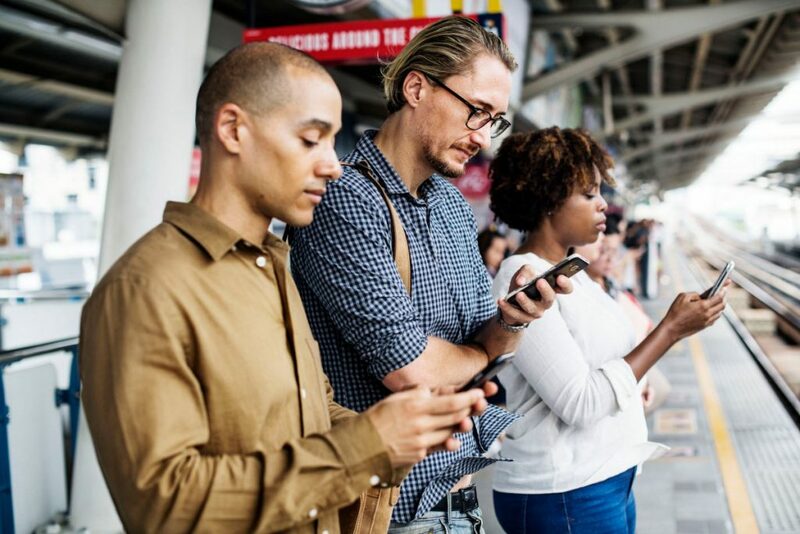 Younger populations are the most affected as millennials live their lives through their devices but older enthusiastic phone adopters also feel the effects. But the way we physically use phones isn’t the only influence on our posture. Yes, the hunched position we adopt for scanning our Instagram feed creates tension in the postural muscles. But indirect causes such as stress, anxiety, loneliness and depression contribute too. Depressed, stressed people do not generally walk with confidence or sit with straight backs and open shoulders. Overuse of phones can also lead to sleep disturbances, which has the chain reaction effect of lowering our immune system, impacting our posture, and increasing levels of stress and depression. Our posture affects our mood and emotions, which affects our health, which changes our breathing pattern, which changes our posture again. And so the cycle continues. The good news is by changing your posture you can help break the cycle, shifting your emotions, making it easier to access your optimal breathing muscle, the diaphragm. If the muscles in your upper back, neck and chest are so jaded from slouching that they won’t budge, you’ve got work to do. And in some cases, the damage is irreversible. But don’t let that dissuade you. There’s plenty you can do to improve your posture. And with each incremental improvement, you’ll notice a change in the rest of your body. Remember that small changes make a big impact. This is the one time a physiotherapist is going to ask you to slump and slouch(only if it is pain free). Now in this position try and breathe in. Hard to do a belly breath right? Poor alignment in that slumped position means your diaphragm can’t descend easily making it hard to activate the posterior half of your diaphragm that attaches to your lower ribs and spine. Your body will want to get air in still so it can replenish its oxygen stores. To do that it has to recruit its back up breathing muscles around its neck and chest to help inhale, expanding the rib cage to get air travelling down into the lungs. These neck muscles are not very efficient and are not designed to be used for the 17,000 breaths we take on average per day. They get tired, fatigued and we create muscle trigger points that can generate headaches, jaw and neck pain. Research into breathing patterns and emotions has also shown that when you adopt a slumped posture/breathing pattern you experience sadness. The powerful finding in this research is if you change your posture and breathing pattern you can change your emotion. What if the world all knew how to breathe in a joy breathing pattern? What impact would that have on our conversations and relationships with others? To learn more about Joy breathing you can sign up for the first 5 days of The Big Exhale Online Breathing coursetoday. Phasic muscles, consisting mostly of fast-twitch fibres are the primary movement muscles of the body. Phasic muscles generally come in pairs (biceps – triceps, quadriceps – hamstring) that work against each other (to control movement and stability). The torso is where most of your postural muscles live and do their work. Activating your postural muscles might sound difficult and there’s no denying that for the untrained and deconditioned muscles, it takes effort. But the rewards of proper postural muscle control are huge. Anyone that sits at a desk or uses a phone for long periods should pay close attention. Our diaphragm is our main breathing muscle doing 80% of the work of relaxed breathing. It sits like a dome separating our lungs and abdominal cavity and has several key roles including respiration, stability and speech. When we look at activating our core muscles the first step we need to be do is learn to breathe. Then our core cylinder, which includes transversus abdominis, multifidus, pelvic floor muscles and diaphragm, can activate to provide core postural alignment and support. But often breathing is the last thing we think about when it comes to finding optimal posture. In the modern work environment, the body is required to recruit postural muscles more than phasic muscles. Sitting and slouching are not fast-twitch muscle activities. As a result, the phasic muscles begin turning off. Our nervous systems use them less and the connection breaks and the Cinderella Hypothesis is activated. A study from 2018 found that exercising and activating the deep muscles of the body significantly improved the body’s alignment but also increased breathing capacity. The breaths you take depend on the strength and coordination of the breathing muscles in the body. Like any muscle, breathing muscles need training too. For many of us in the office-work environment, deep muscles are not something we concern ourselves with. Sitting for long periods does not challenge the deep muscles of the body in a positive way. We’ve lost the ability to recruit these muscles. Proper training by a physiotherapist, exercise coach, or breathing coach can help bring back this ability. Take a moment now to length through the crown of your head growing tall then take a breath into your belly. It’s easier, right? Even the act of putting yourself more optimal position for your spine allows the right muscles to activate drawing air into the lower lobes of the lungs where the best bloody supply is. Our bodies know what’s good for them, even if we don’t. If we don’t breathe in this way the habit of dysfunctional breathing can get stuck altering your blood chemistry and blood flow around the body long term. Yes, it can. One of the main reasons it does this is by limiting your ability to access your diaphragm and belly breathe. Your brain can’t get the oxygen it requires and you experience a sensation of ‘air hunger’ so it will recruit your back up breathing muscles that we have highlighted above. These need to work more frequently to get the required oxygen intake which makes you breathe fast and shallow. Over time that faster breathing expels too much carbon dioxide from your blood and alters your blood chemistry. The receptors in your arteries then set a new threshold of carbon dioxide and when you reach it will stimulate you to breathe faster then you may actually be required. The shortness of breath sensation can come from your body requiring oxygen or that your suffocation response has been triggered with an increase in carbon dioxide levels. It is important to work with your GP and breathing physiotherapist to rule out other reasons for shortness of breath. When you alter your breathing pattern, even the easiest forms of exercise can become difficult. This is what happens to people with poor posture. They can’t get sufficient intake of air or stay hyperinflated and they struggle to complete tasks that the average person has no difficulties with. Learning to breathe in a way that is appropriate for the task in front of you can reduce that feeling of shortness of breath. Breathing 360 degrees into the belly and back using the diaphragm with good posture can help with reducing shortness of breath long term. What can you do to improve posture and breathing? Take a break. A small amount of movement frequently through the day can help reset our postural muscles and burn off the adrenalin dumping into our bloodstream when stressed. Change phone. 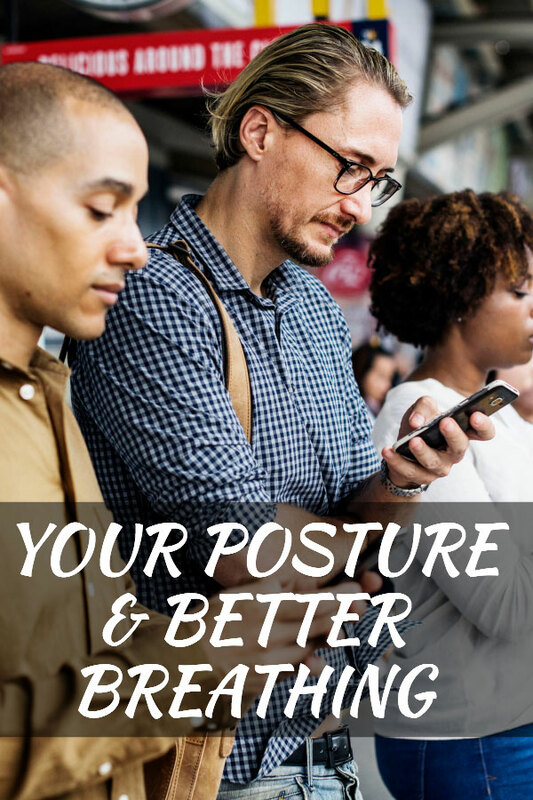 The type of phone you use affects the level of postural stress. Bigger, easier to read phones with better ergonomics might help. Dump the phone and have a technology holiday. A bit drastic, but what’s more important, Facebook or your health? Why not start with one day a week that is technology free. Do yoga, Pilates, or some form of stretching. Exercises like the downward dog, cat-cow, and chin tuck are great for stretching those tight shoulders, upper back, and neck muscles that get over worked (just like Cinderella) when stressed. Check out our free 15 minute pilates video that shows you how to release our back up breathing muscles that get tight with breathing dysfunction and poor posture. Good Ergonomics. Computers have the potential to improve our posture if used correctly. Standing desks and ergonomics go a long way towards not only fixing postural issues but improving concentration, reducing fatigue, and creating a more creative environment for learning. Find neutral. Good posture isn’t about standing bolt upright and having shoulders pinned back. It is about finding neutral position of our spine and limbs making it easier to adopt a joy, belly breathing technique. Set an alarm every 30 minutes when at the computer or sitting to reset your posture. Practice makes perfect. Perform breathing techniques – Not only will controlled conscious breathing exercises help activate the diaphragm, the physiological and mental responses to proper breathing helps reduce stress, anxiety, and depression. When feeling stressed, focus on the exhale. Remember without fail, exhale. Emma Ferris is a health professional that connects the dots. As a physiotherapist, breathing coach and public speaker, Emma has seen the impact of poor posture on her patients and their breathing. Creating small changes in our lives even if it is just how we sit, stand or walk can be very powerful. 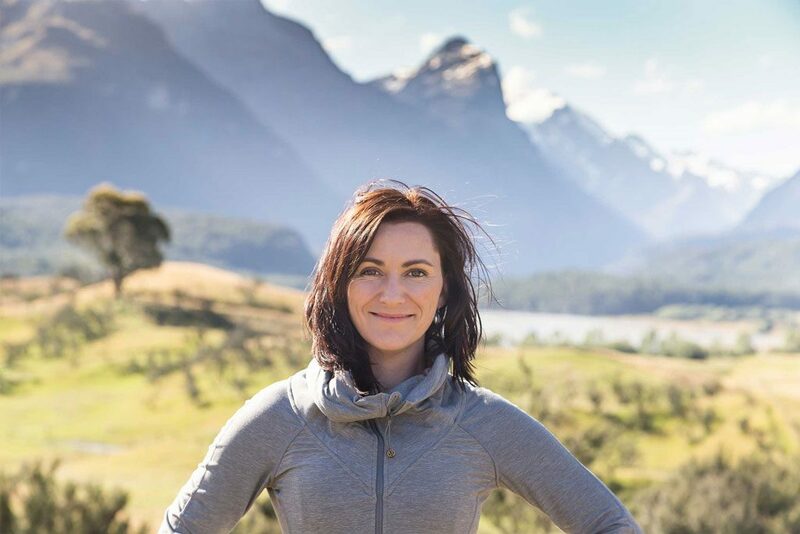 Learning how breathing, emotions and posture are all linked together has sparked Emma to teach people around the world to reset their daily habits. Sometimes it can be as simple as a technology holiday to stop unnecessary loading on the body.